I thought after two and a half years of work I would post a couple of photo's of my project. Its a lot of work put its something to do. Bob it's a great job!! how did you build the plug? is it CNC machined or hand made? Is your intention to build an aircraft using the same method used by Velocity in which 2 halves are put together ? The reason I ask is Velocity has a top and bottom mold, the photos you posted makes it look like yours is comprised of 3 or 4 pieces to build the fuselage. Looks very Berkutish, is the A-Solution going to have a split canopy and be full RG ? Looking back I remember a couple of friends stopping by the hangar one day for lunch. One of them had just sold a Long Eze project. 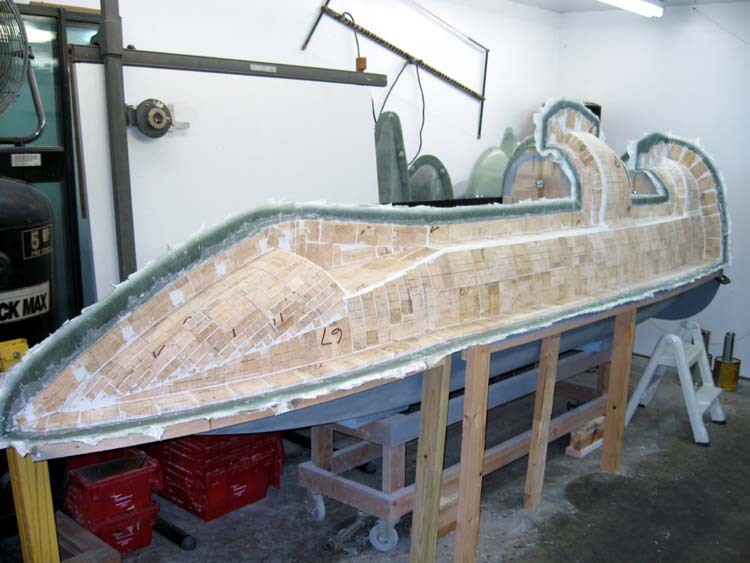 I brought up at lunch the building of the tooling to make a fuselage. I guess that it’s over lunch or out on the golf course that a project like this starts I don’t golf. Not being computer savvy I built the plug the old fashion way. I wish I was as talented as some of the others posting on this site. 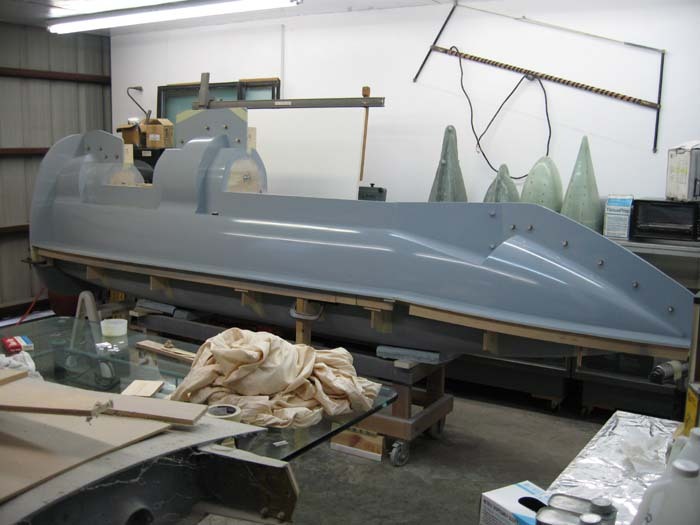 The tooling has been built to make the fuselage in two parts, one upper one lower. 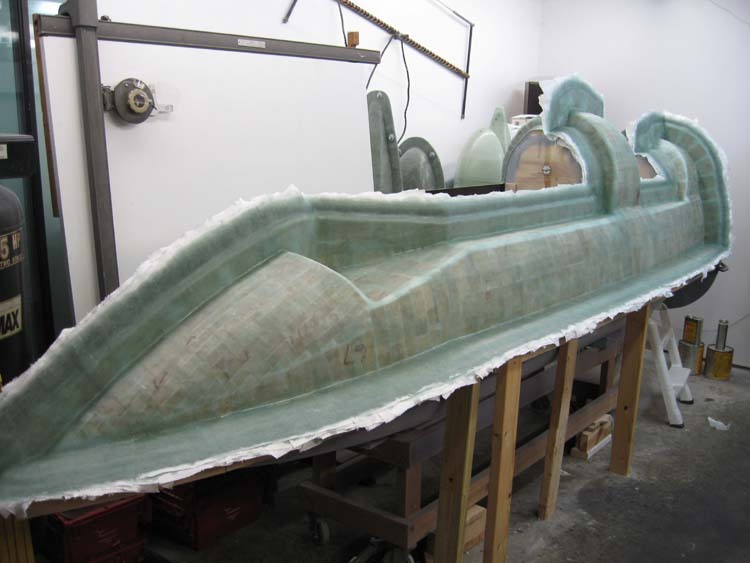 The upper tooling had to be made in two halves to get around the draft of the canopy turtle decks. My reasoning for that was to get a better fit for the canopy frame and to do some of the other lay ups in the turtle deck areas. 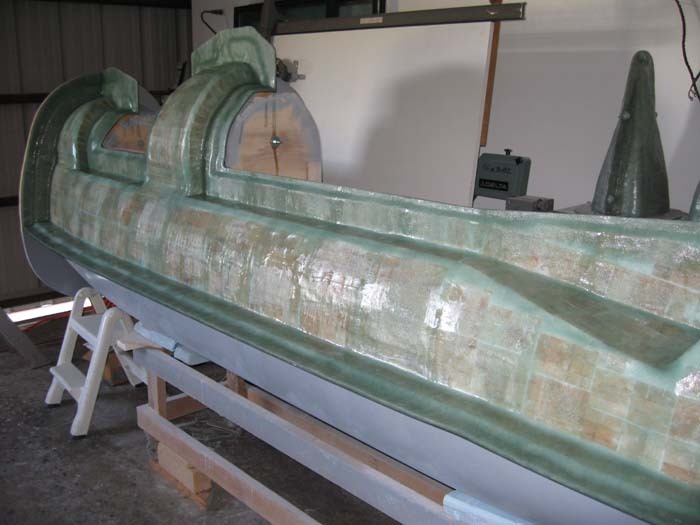 The roll over structure could be laid up in the tooling with know secondary bonding for that part of the lay up. 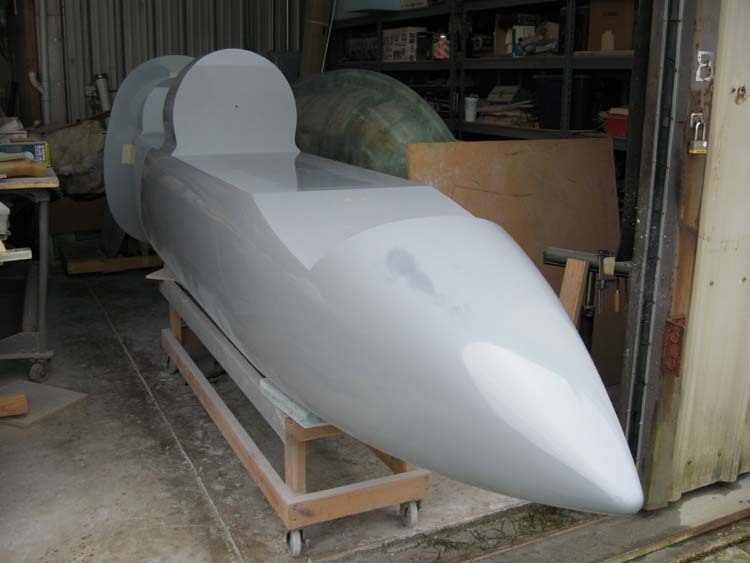 The main tooling has been made to have a split canopy. 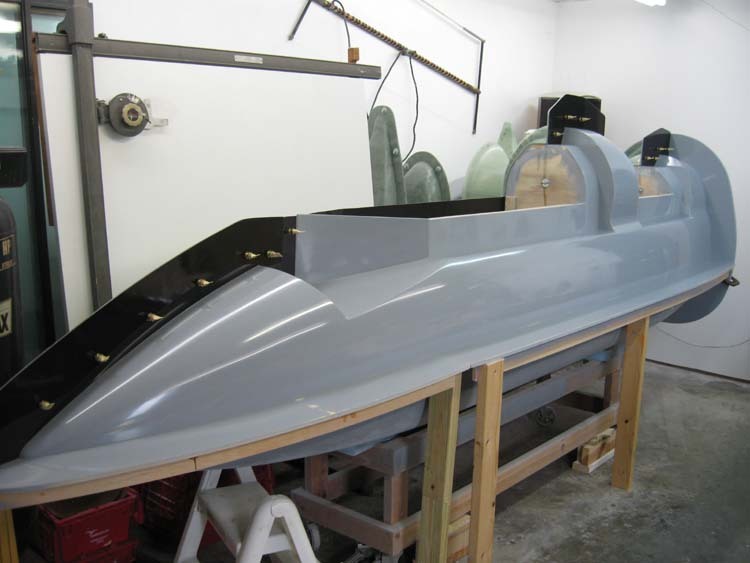 The canopy frame tooling has been made to produce that style as well as a full tilting frame. Whats the plan for the parts? Will they be available? should I start selling stocks?? I guess the real motivation to this project was that I wanted one of these. I did not fell I could get there without a molded fuselage. Like all things you think you can get things done a little quicker. Your friends always challenge you. 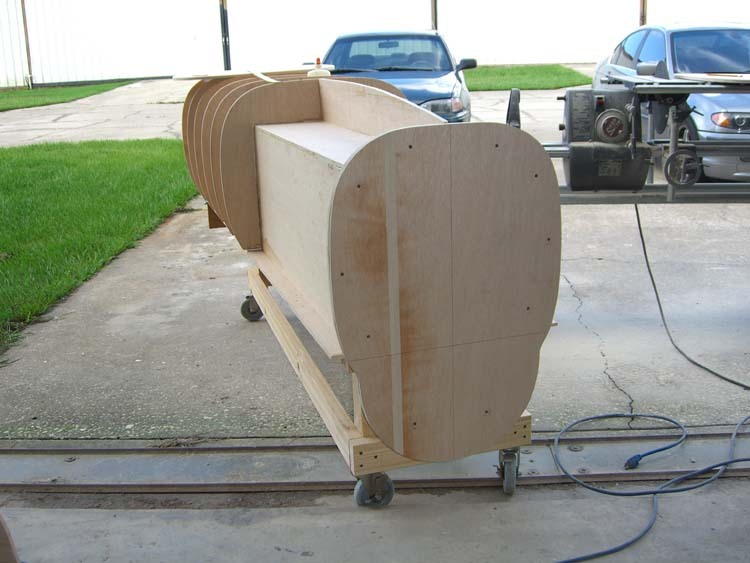 One of those things was to build a CNC foam cutting machine for the canard and wings. Works great but a lot of work. 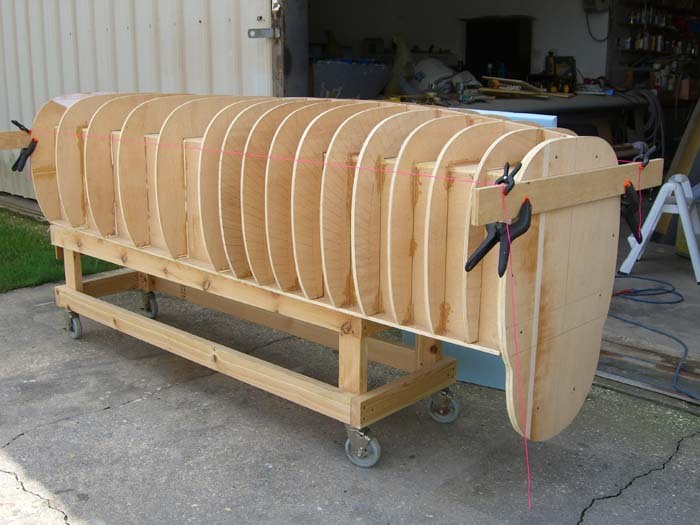 The fuselage is going to be able to go as a fixed gear with retracting nose or full RG. The RG is going to that a little thought. 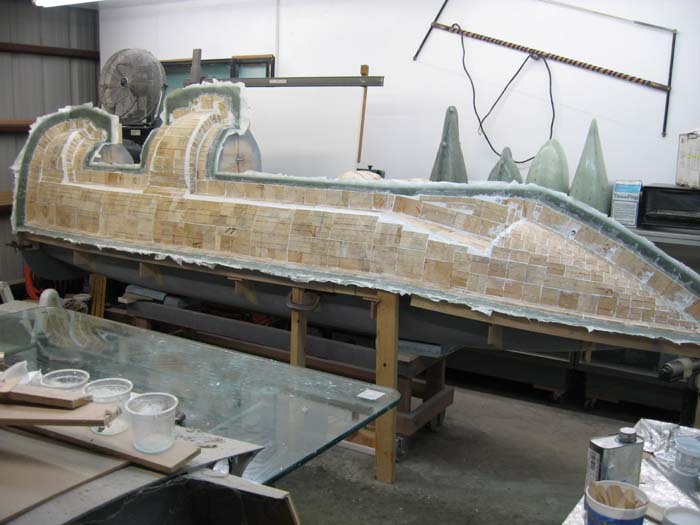 I’ve set aside this Monday and Tuesday to build the left upper side of the tooling. The tooling is going to be made in three parts. Two upper One lower. The two uppers will be used to make One upper piece. This fuse set-up looks like its going to be lite-lite-lite. Love what you are doing, keep it up! Thanks- Here is a photo of the early days of the project. 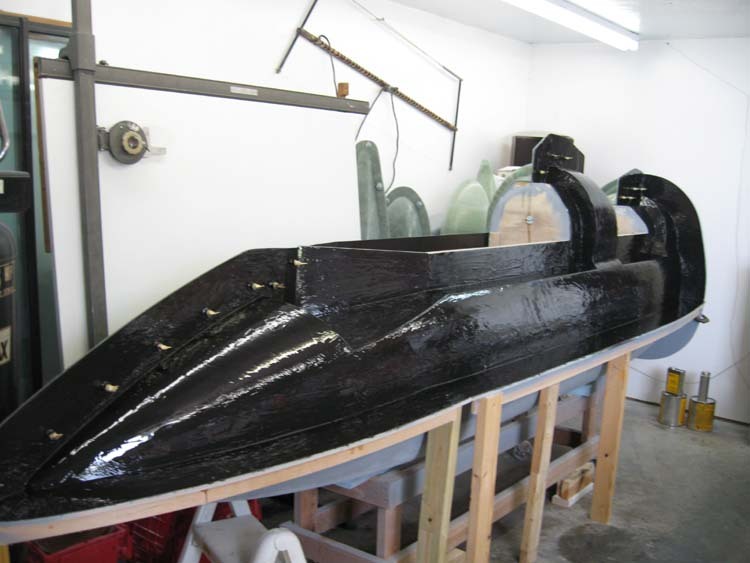 Note, I bought a canopy for the project to assist in making the canopy frame tooling (that canopy is now lost under fiberglass and filler, my way of lofting the canopy frame tooling). 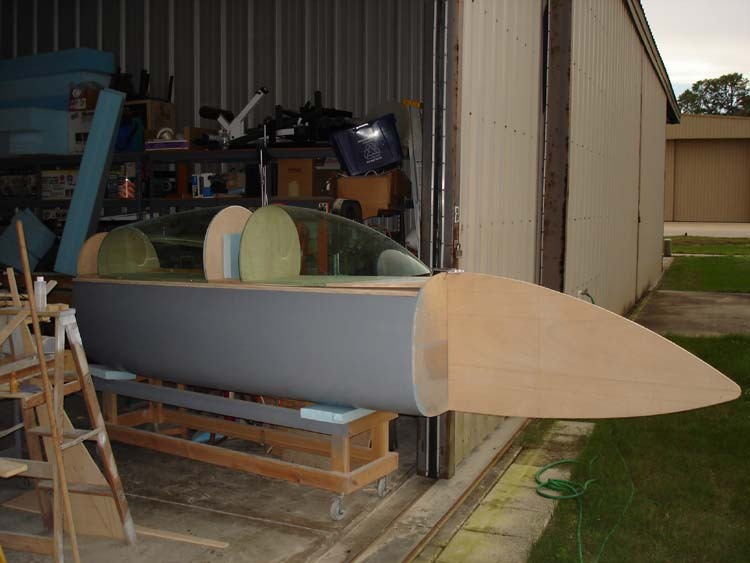 The frame tooling was a separate part but was built with it setting on the fuselage plug. That allowed me to keep W/L 23.0 with the fuselage plug. 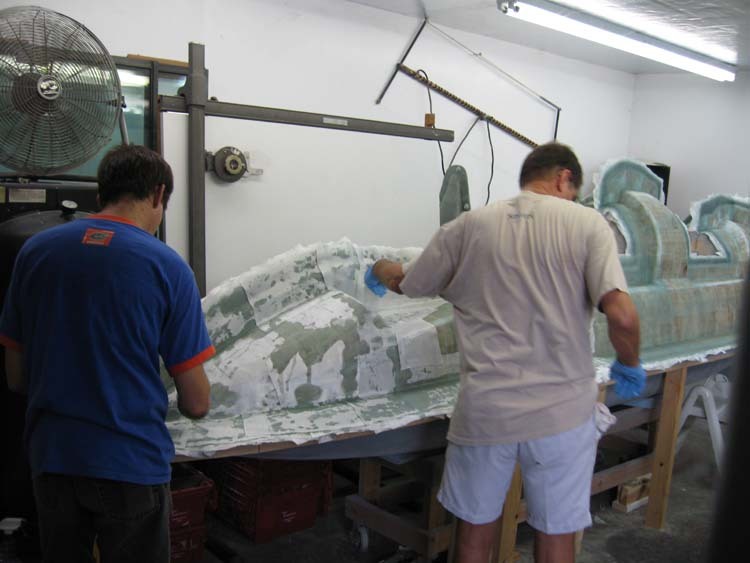 Even with the use of the canopy (which by the way was really nice) needed a lot of work to get the tooling worked out. Sorry- Missed one of the photo"s for the upper post. Told you I was not computer savvy. I like very much your work and know very well how hard is to build something like that since I've done something similar. the hardest part for me was to check it for right/left symmetry. I have built the thing on an automotive frame repairing bench but I found that I could not do better then 1-1,5 millimeter error so at the end I decided to have the whole thing laser scanned and analyse it with a computer software. Enzo Ferrari " you no-a can-a see-a both-a sides-a at the same-a time-a"
Root beer shot outta my nose when I read... thanks Lynn for the classic response. Beautiful work...obviously not essential at our speeds...but beautiful work. Lynn it's true!being hand made things I do not see how those aircrafts could all be 100% perfect. Tony said that even his berkut was not perfectly straight. may be I am too manic about it but even if I do not see how a so small error could affect the behaviour of my aircraft nor I can see it looking at the fuselage, when I'm resting in my bed it seems like the error calls me saying "hey, you can't see me but you know I'm here!!". but it's true: perfection is not something about humans. 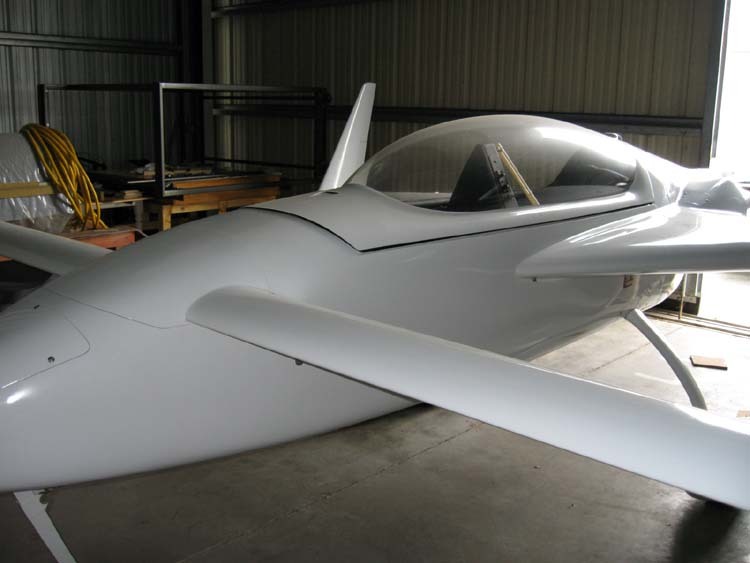 I really like this sentence:"I can not say its perfect, but I’m not either"
Again airnico, as I said last year, " Your fuselage you have come up with is absolutely, to my eye, one of the greatest custom shapes for the Long Eze. I wish you would post a pic here again for everybody to see. I think its because of your Italian eye! I will post something soon, just the time to do some last minor job and I'll be ready to build the mould: I'm becoming more and more impatient!! Another big day today. Got five of my friends ( Bill, P.J., Allen, Dennis, Sal and Paul, Paul could not make it today put has been a big help, hope he fells better ) to help in building the left side upper tooling.Twelve hours later and another seven tomorrow. I'm going to let the tool set till Friday or Saturday before pulling both sides. A real step forward in the project. Boys and girls it beat me up, I guess I,m not as young as I used to be. I put the 12inch canard stretch in the plug for the 360 or 540 engines. Did you do the same. I just could not go the sleep without telling a related story. Its just to funny Not to tell. I my early days of building my Vari Eze I had built the spar, And after it had cured over nigth I took a look at it the next morning a found a small defect in the inspection hole opening (real small defect). 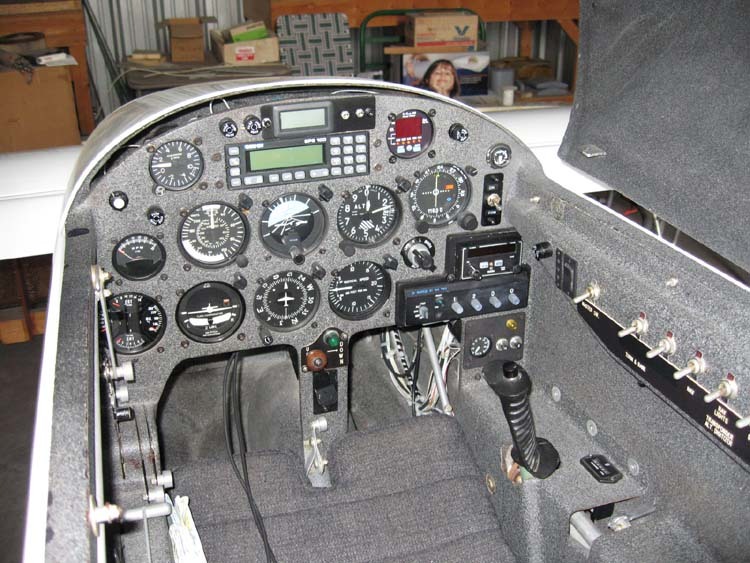 I had another Vari Eze builder From are EAA chapter stop by and look at it. Needless to say he thought I did a great job and not to be concerned. You know I was not able to sleep for the next two nights (REALLY). It got so bad that second night at about 2 A.M. in the morning I went downstairs and took a big saw a cut the spar in half and went back to bed (fell right to sleep). Started on the new spar the next day. We all have a little Superman in us, I know I can see right through my project. So I know right were your coming from. Hers a couple photo' of my Vari Eze. So you know what I'm talking about.....really funny, may be it could sound even crazy to someone, but when you start building something like that you want to do 110% your best every day, no compromises, otherwise do not start at all. I did not stretch the fuselage because I actually did not have experience on this mod, there is a guy here in italy who is building a berkut but I was not able to have any collaboration whit him so I preferred to stick to the original canard position, but I have a quite long nose to put ballast in. I have later met a friendly guy who has built a stratched fuselage and he reported to me that it flys better than his previous per plans Long-Ez: according to his words it has superior stability and can fly to greater angles of attack. 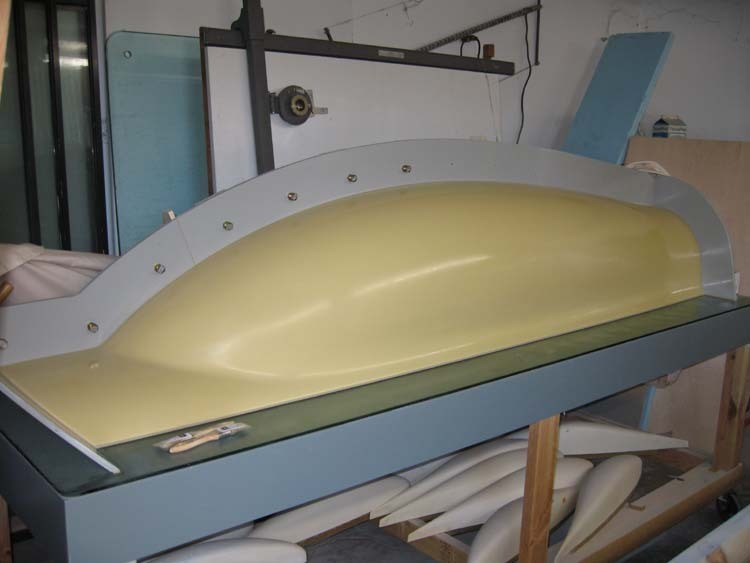 Did you put the 12" stretch between the canard and main wing or does that include adding to the nose? I was looking at adding 6" between the back seat of the pilot and rear passenger for more leg room and dual controls. Getting closer to seeing if its going to come together. Finished the Left upper tooling lay-up today. I've been waiting four weeks to see whats underneath. You cannot remove the right side till the left side has been done. After some trim a clean-up this week hope to see what it looks like this weekend.